Iams Purrfect Delights use high-quality protein like salmon, tuna, chicken, and turkey for variety your cat will love. 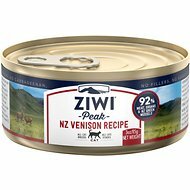 This meal has no added gluten, or artificial flavors, so you can feel even better about feeding it to your furbaby. Fish Broth, Tuna, Mackerel, Modified Tapioca Starch, Sunflower Oil, Natural Flavor, Calcium Sulfate, Tricalcium Phosphate, Guar Gum, Taurine, Minerals (Iron Glycine Complex, Zinc Glycine Complex, Manganese Glycine Complex, Copper Glycine Complex, Sodium Selenite, Potassium Iodide), Choline Chloride, Carrageenan, Vitamins (Vitamin E Supplement, Niacin Supplement, Vitamin A Supplement, Vitamin B12 Supplement, Pyridoxine Hydrochloride (Source of Vitamin B6), Calcium Pantothenate, Riboflavin Supplement (Source of Vitamin B2), Biotin Supplement, Vitamin D3 Supplement, Folic Acid, Menadione Sodium Bisulfite Complex (Source of Vitamin K3)), Thiamine Mononitrate (Source of Vitamin B1), Magnesium Oxide, Sodium Nitrite (To Promote Color Retention). For Adult cats, feed 2 1/4 - 3 cans per 8 lbs body weight per day. Provide fresh drinking water at all times. Refrigerate any unused portions. Introduce the new food gradually. This is the most successful way to ease your cat into the diet change. Start by mixing 25% new food with 75% current food. Slowly change the proportions over the next three days or so by gradually increasing the amount of new food and decreasing the amount of current food. At the end of this weaning process, you should be feeding 100% of the new food. You may encounter difficulties; for example, your cat might choose to eat only the old food, or not eat at all. However, a healthy cat can miss meals for a day or two with no ill effects. IAMS asks you to try their cat food and look for the visible differences their food can make. The difference you'll see in your pet's health comes directly from the nutrients and vitamins you're putting into her bowl every day. IAMS is formulated with premium protein, a unique fiber blend and a customized mix of protein and carbs. The result is a diet that promotes a healthy weight, supports digestive health and gives her energy for all kinds of frisky business. Protein is a key ingredient in IAMS cat food recipes. IAMS is made with high-quality protein to help your cat maintain strong, lean muscles. Animal-based proteins like chicken, beef and salmon can help your cat maintain healthy muscle structure and support an ideal weight. And they naturally provide all of the amino acids that cats need to thrive. IAMS delivers a customized mix of protein and carbs to keep your cat energized and ready for pouncing and playing. As carnivores, cats need a diet that's high in animal proteins with the ideal ratio of protein to carbohydrates to maintain a healthy energy level. Cats on an IAMS diet are getting essential amino acids, including taurine, plus the amount of carbs they need for hunting feathery toys. Getting the right amount and type of fiber is important for your cat's digestive health. IAMS uses a proprietary fiber blend that includes prebiotics and beet pulp. Prebiotics feed the good bacteria in the gut, and beet pulp is a great fiber source that promotes a healthy digestive tract. Every IAMS recipe is tailored to your cat's nutritional needs with the proper level and right kind of fiber for healthy digestion. IAMS is so sure that you'll see a visible difference in your pet that they back their food with a 100% satisfaction guarantee. Their recipes are formulated based on years of research and a dedication to keeping pets healthy through proper nutrition. IAMS believes that the right diet can do amazing things for your pet's health, like aid in weight loss, promote good digestion and increase energy levels. IAMS is driven by a philosophy of innovation and an emphasis on advanced pet nutrition. Through extensive research and a unique understanding of dietary requirements for dogs and cats, they've developed diets that help pets thrive. Their formulas meet the everyday needs of pets and their owners with options for every household. IAMS is a leader in pet nutrition that has provided 60 years of nutritional excellence with innovative products that help improve the health of pets worldwide. when I have a cat not eating well, this tuna will always tempt them. I do not feed it daily because I want it to be special, but it always works when someone is turning up its nose at the standard fare. MY CATS LOVE MOMMY FOR BUYING THIS! I cannot get this in the stores anymore in Cleveland, Ohio. My cats love it. It always arrives fresh. Thank you so much. Owner of TRIPLETS! Unfortunately my cat stopped eating all flavors of the delights after a few days. Now I have 45 cans that will not be eaten. She does however like the delicious flavors. Of course she likes the expensive flavor. My cat really seems to like this food, however everytime he eats it I can smell it for hours. Cost of owning a cat! Iams 3-oz can Flaked Tuna and Macerel cat food. Bubba loves this! I love the convenience...and price. My elderly cat will only eat Tempt Me Tuna and Mackerel. I have tried other foods and she will not eat them and then she will sit and cry. Thank goodness for Chewy. I got her food the next day. My elderly girl is happy and so am I.
I have 3 cats. All have different tastes in wet food. It doesn’t matter with this purrfect delights. They wake me up a 4am to eat. I’m not sure what Iams put in this can, but my cats go nuts for it. I’m scared they might hurt me if I don’t provide them with a constant supply. Only Iams will do !! Permie, my soon to be 3 yr old female kittie was distraught when I stopped being able to purchase her Iams Tuna & Mackeral Dinner food. I was so thrilled to learn that I could purchase her food through CHEWY in a 24 case for her. 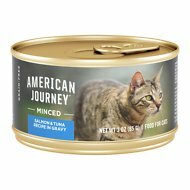 Both of my kitties love this food, but Permie will only eat this moist food and it is a regular part of her diet since I adopted her. wish I would have discovered this food earlier. I have some picky ones and everyone eats this.